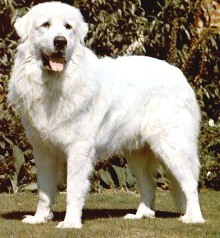 I am also known as the Pyrenean Mountain Dog and my relatives have guarded flocks of sheep in the French mountains for thousands of years. These days, I work with farmers and ranchers to help them look after all kinds of livestock. My beautiful double coat comes in solid white or white with gray or tan markings. I do not need professional grooming; just weekly brushing and an occasional bath. My termperament is such that I seem to almost sense when something isn�t �right� and I have earned a good reputation as a guard dog, but I am docile and easygoing with my family and extremely patient with children. Because of my size and strength, it is wise to let me get people-oriented while I am still a puppy and to be sure that I have basic obedience training. When fully grown, I am between 25 and 32 inches tall (63.5 to 81.3 centimeters) and I weigh between 90 and 130 pounds (40.5 to 58.5 kilograms). We have no Great Pyrenees Breeders listed at this time. Click here to place your Great Pyrenees Ad!